Bakhdida (Syriac: ܒܓܕܝܕܐ, Arabic:بخديدا) IPA: [bɑχdɛːdə], also known as Baghdeda, Qaraqosh, Karakosh or Al-Hamdaniya, is an Chaldean city in northern Iraq within the Ninawa Governorate, located about 32 km (20 mi) southeast of the city of Mosul and 60 km west of Erbil amid agricultural lands, close to the ruins of the ancient Chaldean cities Nimrud and Nineveh. It is connected to the main city of Mosul by two main roads. The first runs through the towns of Bartella and Karamles which connects to the city of Erbil as well. The second which was gravel until the 1990s when it was paved, is direct to Mosul. The name Bakhdida (Syriac: ܒܝܬ ܟܘܕܝܕܐ; Beth Khdeda), is of uncertain origin and when translated from the Syriac language it has two components Beth which means "land" or "town", and Khodida which could either mean "Youths" in Aramaic or actually "Baghdadak" a diminutive form of Baghdad, Old Persian meaning "God's gift.". Some also believe that Bakhdida comes from the Aramaic Beth Deta, meaning "Land of the Kite". During the Ottoman period, the Turkish name Qara Qoş (Turkish for black bird) came into use, with Kara Kuş as an alternative spelling based on Modern Turkish orthography. Finally, and as part of the Arabization policy in the 1970s, the Iraqi Ba'ath government changed the village name to Hamdaniyya, naming it after the Arab tribe of "Banu Hamdan", who ruled Mosul in the middle ages. Agriculture was the main source of living for the people of Bakhdida. It also prospered on handicrafts such as weaving and producing leather coats which are locally known as Farawee made of sheepskin. Today, Bakhdida has become a center of trade and business with many roads, shops, houses, buildings and lots of government employees but still agriculture and farming are the main sources of living as since the 1980s many people own and run chicken farms with modern facilities. The vast majority of its inhabitants are ethnic Chaldeans, more than 70% of whom are members of the Syriac Catholic Church, while the rest are Jacobite Syriac Orthodox. The recent wave of violence targeting Christians in Iraq forced many Chaldeans living in major Iraqi cities to move to Chaldean towns in the Nineveh Plains, which swelled the town with an influx of refugees mainly belonging to the Chaldean Catholic Church and the Church of the East. The main language spoken is the Nineveh Plains variant of Syriac, which is almost identical to that spoken in other major Chaldean towns (like Alqosh and Tel Kepe) in the region. Arabic is also used as a second language. English is widely understood by younger generations. As of now, the Al-Hamdaniya Municipality also includes towns of Bartella and Karamlish and tens of other smaller Chaldean villages. It is thought that the ancient city of Rasin mentioned in some texts was in Bakhdida. Furthermore the town is situated 5 km north of Balawat, where important Chaldean artifacts were found by the Chaldean Hormuzd Rassam; most of them are displayed at the British Museum and the Louvre. A variant of the name Bakdedu is said to be the place of a decisive battle between the Ancient Chaldeans and the Babylonians Chaldean people in 610 BC after the fall of Nineveh by the Native Chaldeans of Mesopotamia. The town then became part of the consecutive empires that ruled the region. Persian influence can be still seen by the possible explanation of its name. Many gods worshipped before Christianity was established were of Chaldean and Persian origins. The Chaldeans of Bakhdida became Christians during early Christianity. With the Christological disputes of the 4th century, they followed the Church of the East teaching but switched to the Syriac Orthodox Church through the influence of Shapur of Baghdeda in the 7th century. 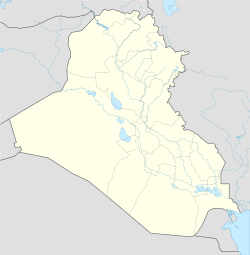 Bakhdida's population is indigenous to the village; however, Chaldean and Syriac Christians from other regions of Mesopotamia have moved to and settled in Bakhdida. In 1089, the Church of Mar Aho Dama in Tikrit (built before the 10th century) was looted and taxes on its Jacobite population became so unbearable that most of the Christians left the city and the Jacobite Mapharian, Youhanna IV Saliba, followed suit and moved to Mosul. Many of these Tikriti Christians moved to Baghdeda and later a few Mapharians settled in it as well. Still, the town would be a great anthropological study with many rooted family names such as Assu, Ashu, Ballu, Gadju, Hallu, Jadju, Olo, Rammu, that reflect Chaldean Akkadian influence. In their literature and writings, the Chaldeans of Baghdida remember vividly the raids of the Persians and Kurds on their village and churches. In 1171, while the governors of Mosul and Damascus were fighting each other, the Kurds used the opportunity to attack the Mar Mattai monastery. According to the 13th century writer Bar Hebraeus, in 1261 the Kurds came down to Mosul, killing many Christians who refused to follow Islam and looting their homes and churches. The Kurds then occupied the nunnery of Muqortaya and killed many of the nuns and others who had sought refuge there. In 1288 a battle took place between the Kurds and Tatars near Baghdida. In 1324 Baghdida was attacked by the Kurds again and many homes and four churches were burned. In 1742 the Afsharids led by Nadir Shah plundered and looted the whole region of Mosul Vilayet, including many Christian villages. In 1580, certain Jacobites of Bakhdida began to build relations with Rome through the monastery of Mar Bihnam, but it was not until the 18th century that these Jacobites began to join the Vatican and became known as Syrian Catholics. Recently, the Dominicans celebrated 250 years of their presence in the north of Iraq. There was much unrest between the new Catholics and the original Jacobite Christians. It is reported that when Catholic bishop Essa Mahfoodh went to see the Jacobite Patriarch Elias II Hindi al-Mosulli (1837–1847) in order to secure the division of properties between the two groups, he was received with insulting remarks. The patriarch told the Catholic bishop: "French (Papists), isn't it enough that you divided my people in Mardin? Have you now come to Mosul to do the same thing here?" Backed by the French, the bishop went to Mohammad Pasha, the Turkish governor, and presented his complaint to him. In 1837 the properties (churches and monasteries), manuscripts, and furniture were divided in a special manner between the two Chaldean denominations. In the early 18th century, Persians under the leadership of Nader Shah invaded the Mosul region and most of the inhabitants of Baghdida escaped to Mosul with all their valuables, in accordance with the governor's orders. Mosul was harassed and then besieged for months. However, the Christians defended it and after months of blockade, the Persians finally signed a peace agreement with Mosul's governor Hasan Pasha Al Jalili, and withdrew in 1743. To reward the Christians for their bravery, the Jalili governor permitted many churches in the Mosul region to be restored. Next, the governor sent his son to Constantinople (Istanbul) to meet with the Ottoman Sultan Mahmud I. The purpose for the visit was to ask the sultan for a reward for saving Mosul. The sultan issued an official Firman in 1778 and paid Hussein Pasha al-Jalili 800 Qirsh to buy the village of Baghdida. The people of Baghdida were very upset about what had happened. They met and decided after long deliberation to abandon the village. When al-Jalili heard the story, he felt guilty and decided to return the village to its rightful owners. He issued a decree in 1778, in which he relinquished his ownership to Baghdida, but he kept his rights to receive the tenth of its produce in taxes. This continued until Ayyoub al-Jalili headed the Jalili family. He tried to enforce the Sultan's original firman; however, the people of Bakhdida, as it was known at this time, fought with the help of Bihnam Bounni, who won the case in the Mosul courts in 1920 and traveled to Istanbul and won the case there in 1923. Nevertheless, Ayyoub al-Jalili and the Jalili family returned again and tried to claim ownership of Bakhdida. On 21 Nov. 1949 judge Moslih al-Den al-Salhani awarded Bakhdida to the Jalili family. The people of Bakhdida presented a petition to the Iraqi government in which they explained the whole history of their village, ending the petition with a request for permission to leave Iraq if the government did not return ownership of the village to them. The courts looked into the matter one last time and on 15 March 1954 awarded the village to the people of Bakhdida. The city has created the Qaraqosh Protection Committee, which has 1200 not heavily armed Chaldean security guards dedicated to patrolling the outskirts of the city and keeping the violence at bay. At the beginning of July 2014, ISIS forces attempted to occupy the city. The Kurdish Peshmerga and the Chaldean Qaraqosh Protection Committee successfully defended it, while elders, women, and children fled to neighboring towns, thus joining other Christian refugees from nearby Mosul that had previously escaped the city in fear of the extremists. The Islamists proceeded to cut off the town's water supply. This, together with the rise in the price of oil following ISIS' invasion of nearby oil field and an embargo imposed by ISIS forcing nearby Muslim villages to stop trade with Bakhdida, rendered life difficult in the town also burdened with incoming refugees. On 6 August 2014, the Kurdish troops withdrew from the city and the next day Islamists from ISIS invaded the city. Much of the population, including recent arrivals, was left joining the 150,000 Chaldeans fleeing, though they were forced to walk towards Erbil without their cars and possessions as Kurdish forces feared Islamist infiltration. It is 32 miles (51 km) southeast of Mosul. Since the late 19th century various locations on the outskirts of the town were excavated by Hormuzd Rassam. 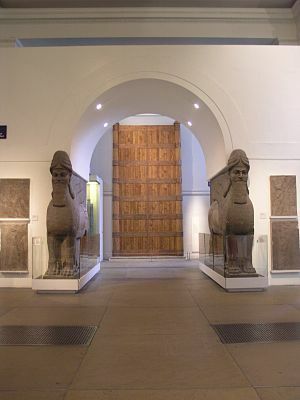 In Balawat (the ancient Chaldean city of Imgur-Enlil) a number of Chaldean artifacts have been excavated; they are currently displayed in the British Museum and Mosul museum. There is a lot of interest in the archaeology of Baghdida today. It has many Chaldean remains, like those of Tel Bashmoni (Beth Shmoni), Tel Muqortaya, Tel Karamles, Tel Mar Bihnam and others. These mounds were fortresses, temples or buildings that belonged to the Chaldean capital of Nimrud. Throughout 1922, 1927, and 1935, archaeologists found gold pieces and cylinder seals, as well as an Chaldean statue (now in Mosul museum) in a well in the church of Mar Zina. In 1942 an Chaldean bathroom and several graves were found near the church of Bashmoni. Furthermore, during the 1980s excavations in the grounds of the Church of Mar Youhanna (Saint John), archaeologists found human remains inside graves in the eastern side and at a depth of one and a half metres. These graves were built with typical Chaldean large rectangular bricks. References to Mesopotamia continued in texts from Baghdeda. Mapharian Athanasius Ibrahim II of Tur Abdin visited Tikrit, Baghdad, and Arbil to attend to his congregation. According to Afram Abdal al-Khouri and his book al-Lu'lu' al-Nadheed fi Tareekh Deir Mar Bihnam al-Shaheed (The Layers of Pearls in the History of the Monastery of Martyred Mar Bihnam), 1951, p. 219, Sony writes: "in 1365 the Mapharian came to Athur or Mosul and was welcomed by Nour al-Din the Chief of Baghdeda … " (Sony 1998, 699). Last but not least, Sony writes that in 1294–1295 (according to the Mar Bihnam monastery archives) a certain king "came to Lower Athur, the city of Saint Mar Bihnam … " (Sony 1998, 95). This church was mentioned by Mapheryan Denosyos Mosa (1112–1142) who visited the church in 1129. It was also mentioned also by Mapheryan Egnateyos La'Azer (1143–1164). This church houses the remains of Mapheryan Deosqoros Behnam II who was buried there in 1417, and that of Mapheryan Baselos Aziz who was buried there in 1487. Several attempts were made to reconstruct it. The first was in 1745 to rebuild what was destroyed by Nader Shah in 1743. It was rebuilt again 1847. The last reconstruction for this church was conducted in 1964. This is the largest church in Bakhdeda and Iraq. Building of this church started in 1932. Phase one was completed in 1939, and final phase was completed by 1948. Historically this church was called Church of Mar Andrawes. It was taken over by Catholics at the order of Hassan Pasha Al-Jalely in 1770 and renamed Mar Jacob. It was reinvigorated in 1970. This church was built prior to 1748 when its name was mentioned by the priest Habash bin Joma’a. This church was standing prior to 1269 when in it was mentioned in an inscription written by Joseph bin Khames Al-Senjari. This church was first mentioned in 1589 by the priest Jacob bin Eliya bin Hirmis who was referring to the reconstruction being done on it, which indicates that this church was built many years before that. It was also reconstructed in 1744 and recently in 1964. This church was built in 2008. This is the oldest church in Bakhdida. Possibly this church was built in the sixth or the 7th century. It was burned by Nader Shah in 1743 and reconstructed in 1744. This church was built prior to the 8th century, since its records indicate that it was reinvigorated in 791. It is a famous among Syriac from other parts of the region. Once a year, thousands of believers from around Bakhdeda come to visit the church and celebrate Mart Shmony's and her children's martyrdom. This is an old church in Bakhdida. Not much information is known about it. On Christmas Eve people in Bakhdida enjoy the Fire that is lit in the yard of the church of immaculate locally known Tahra. Wild plants are collected ahead of the big celebration, a known family is devoted to gather the plants and anybody can volunteer for this task too. Big mass is held on Christmas Eve and all children and crowds of people sing Christmas carols. On Christmas Day people visit each other and have special meals with their relatives and friends. Most people sacrifice animals, prepare Christmas cookies locally known as Klecha; a very special treat stuffed with walnut, coconut or dates. Mar Karyakos is actually ruins of a monastery located about a kilometer east of Bakhdida and lies amid agricultural fields. The monastery consists of three caves that are carved naturally in a hilly rock formed geologically of hardened pebbles. In the middle cave which is the largest stands what looks like an altar formed of piled stones. The altar is lit with candles by believers who visit it once a year on the Sunday before Palm Sunday. Offers are given for the needy people of Bakhdida, after prayers families picnic in the fields that surround the monastery. Very special treat is prepared ahead of this day from wheat. The wheat is washed, soaked in salt water for three days and then dried in the direct sunlight. After it is completely dry the grains are roasted in special pan locally known SACH on the stove. Melon seeds are washed, salted, dried and roasted the same way as the wheat then mixed with the roasted wheat. The final treat is called "kitikelie" that has very delicious taste. The Sunday before Easter is known as Palm Sunday or Oshana. It is the beginning of Holy Week and celebrates Jesus' triumphant entry into Jerusalem on the back of a donkey. Great crowds of people parade the streets of Bakhdida waving olive branches to welcome him. The procession starts at the church of immaculate and ends at the church of John. The people shout "Oshana to the son of David”. In Bakhdida big mass is held at the Church of Immaculate to commemorate what Jesus did with his disciples. It starts as an ordinary mass but includes a dramatic ritual of the washing and kissing the feet of twelve children. The feast of The Triumph of the Holy Cross commemorates the death and resurrection of Jesus Christ. Traditionally, people attend mass and in the evening they lit fires in the streets of Bakhdida and decorate the exterior of their houses with outdoor lights. Traditionally, in Bakhdida, the Church of Immaculate where the Good Friday prayers are held all Virgin Mary’s pictures are covered with black cloth as a symbol of her sorrow as well as a bitter drink is prepared from boiling local tree twigs and flowers. Later, on this morning the bell rings for inviting people to drink it as a symbol of the bitter drink that was offered for Jesus while on the cross.The cross is then wrapped in white fabric and kept in a coffin, and in the afternoon burial prayers are held. Banned prior to the American invasion, this national Chaldean festival has started to gain popularity between youths in the last decade. Originally based on an article by bakdida.com, licensed under the GNU Free Documentation License, used with permission. ↑ Ghassan Hanna. "Bakhdida". Chaldeansonline.org. Retrieved 2010-12-01. ↑ "No Mass said in Mosul for first time in 1,600 years, says Archbishop" (Archive). Christian Today. 28 June 2014. Retrieved on 7 July 2014. ↑ "Balawat (ancient Imgur-Enlil, Iraq)". British Museum. Retrieved 2010-12-01. This page was last modified on 7 August 2015, at 11:10.